1. Republic Act No. (RA) 10157, or the Kindergarten Education Act of 2012, declares that it shall be the policy of the State to provide equal opportunities for all children to avail of accessible mandatory and compulsory kindergarten education. 3. The Department of Education (DepEd) is vested, under RA 10157, with the authority to regulate the organization, operation and/or implementation of the kindergarten education program of both public and private schools. The DepEd is further charged with the function to oversee and supervise the organization, operation and implementation of the kindergarten education program and exercise authority over the operation of private kindergarten institutions. 4. The kindergarten curriculum is designed to respond to the holistic developmental needs of five (5) year old learners along socio-emotional, values, physical health and motor, aesthetic/creative, mathematics, understanding of the physical and natural environment, language, literacy, and communication. Moreover, the first quarter of the curriculum is designed to strengthen the learners’ preparation to meet the Kindergarten learning standards. A. Age qualification for Kindergarten learners in both public and private schools should be five (5) years old by June 1 of every calendar year. However, the school may consider learners entering Kindergarten who will turn five (5) years old by the end of August on the condition that the Philippine Early Childhood Development (ECD) Checklist must be administered to the learner prior to the start of the opening of the school year, to ensure that the learner is capable of meeting the expectations of the grade level. Parents may provide documentation and/or certification of the learner’s previous Early Childhood Education (ECE) experiences (i.e., preschool, day care, pre-Kindergarten) in addition to the results of the Philippine ECD Checklist. ii. 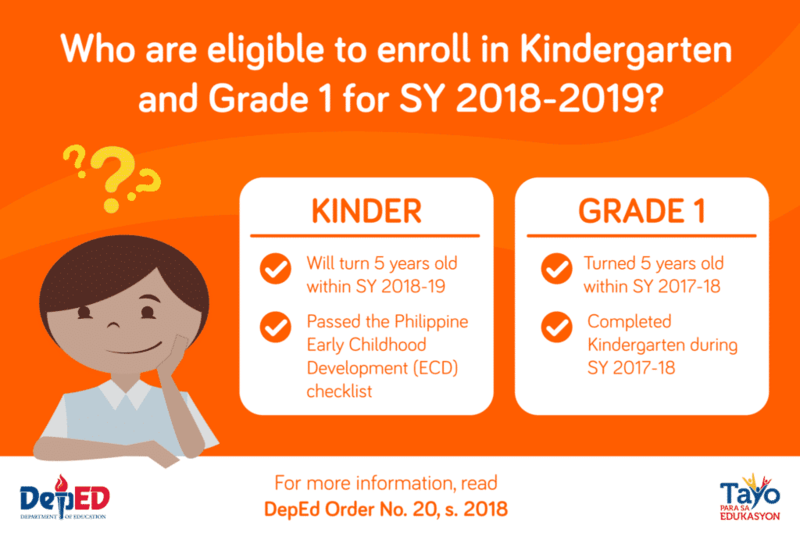 Learners who will turn five (5) years old within SY 2018-2019 can be accepted to Kindergarten provided they pass the Philippine Early Childhood Development (ECD) checklist. ii. Incoming Kindergarten must strictly comply with the cut-off age policy stated in DO No. 47, s. 2016, as amended by this DepEd Order. Both incoming Kindergarten and Grade 1 learners shall strictly comply with the policy as stated under Item VI. 15.A of the enclosure to DepEd Order No. 47, s. 2016, as amended by this DepEd Order. 6. DepEd Order No. 47, s. 2016, Memorandum No. DM-CI-2017-00454 dated 11 December 2017 entitled Clarificatory Guidelines on the Provisions of DepEd Order No. 47, s. 2016 “Omnibus Policy on Kindergarten Education”, DepEd Order No. 3, s. 2018, and all other DepEd Orders, mles, regulations, issuances, which are inconsistent with this Order, are hereby repealed or modified accordingly. 7. These guidelines shall take effect immediately. 8. Immediate dissemination of and strict compliance with this Order is directed. My Son is 5 yrs old and completed the Pre-SChool Education S.Y. 2017-2018 He also completed his day care education SY 2017-2018. Supposedly he will be Grade 1 now. But he will not be accepted because daan muna ng Kinder. kasi affected sa cutoff age before? What is the best thing to do? I will enrol him in Grade 1 pero he will not be accepted because walang LRN. He will turn 6 years old thin november 6, 2018 .Sana naman po bigyan ng kasagutan! kasi sayang ang pera at panahon. “Learners who completed Kindergarten during SY 2017-2018 can enroll in Grade 1, provided that they turned five (5) years old within SY 2017-2018” – how can learners complete kindergarten for SY 2017-2018 when the system only accepts those who will turn 5 years old as of August 2017? My daughter is 5years old and had already taken her pre-kinder last SY 2017-18. Question is will she be enroll as Grade 1 student or Kinder level for this coming SY 2018-19? RA No. 10157, or the Kindergarten Act, Institutionalizes Kindergarten as part of the basic education system and is a pre-requisite for admission to Grade 1.